You must be a member of the San José Out & About in Costa Rica Group to attend this activity. Would you like to join this group? On arrival to Sarapiqui, a beautiful area known for its impressive natural richness, you will board a boat for a relaxing ride on the Sarapiqui River where you will feel in close contact with nature and admire the inspiring surroundings. After the boat ride, you will continue with a walk on Selva Verde Eco Lodge private trails, which are a heaven for nature enthusiasts. Following lunch and on route to San Jose, a visit to the famous Rainforest Aerial Tram is included, for a ride on a gondola through the tree canopy in company of a naturalist guide that will talk to you about the wonderful rainforest. (A 07 cables and 11 platforms zip lining is available instead of the gondola ride if you prefer more adrenaline). 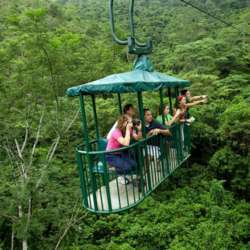 The Rain Forest Aerial Tram – Atlantic is a Protected content (1,200-acre) private reserve that shares a 10 km border with Braulio Carrillo National Park, constituting a buffer zone between the park and farming lands.